Curiosity aka the Mars Science Laboratory. Image Source: NASA. The NASA Mars rover Curiosity, originally launched 26 November 2011, is due to land on the Red Planet at 1:31 a.m. EDT (5:31 a.m. UTC) on 6 August 2012. This rover is much bigger and better equipped than its predecessors Spirit and Opportunity. For a livestream, see below. Three generations of Mars rovers show Curiosity's relative sophistication. Image Source: NASA via Wiki. 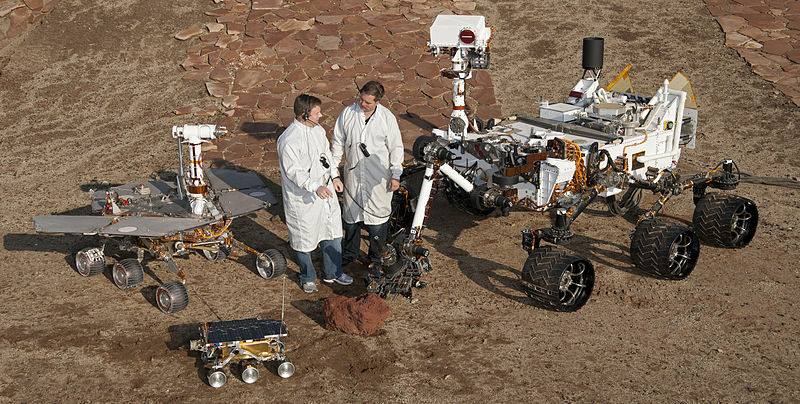 Caption for the above image: Two spacecraft engineers stand with a group of vehicles providing a comparison of three generations of Mars rovers developed at NASA's Jet Propulsion Laboratory, Pasadena, Calif. The setting is JPL's Mars Yard testing area. Front and center is the flight spare for the first Mars rover, Sojourner, which landed on Mars in 1997 as part of the Mars Pathfinder Project. On the left is a Mars Exploration Rover Project test rover that is a working sibling to Spirit and Opportunity, which landed on Mars in 2004. On the right is a Mars Science Laboratory test rover the size of that project's Mars rover, Curiosity, which is on course for landing on Mars in August 2012. Sojourner and its flight spare, named Marie Curie, are 2 feet (65 centimeters) long. The Mars Exploration Rover Project's rover, including the "Surface System Test Bed" rover in this photo, are 5.2 feet (1.6 meters) long. The Mars Science Laboratory Project's Curiosity rover and "Vehicle System Test Bed" rover, on the right, are 10 feet (3 meters) long. The engineers are JPL's Matt Robinson, left, and Wesley Kuykendall. The California Institute of Technology, in Pasadena, operates JPL for NASA. 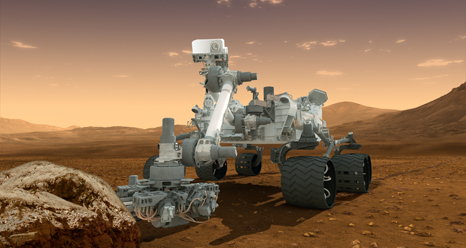 Curiosity will land in Gale Crater. The aims of this mission are to study Mars's geology and climate, to find any possible Martian biological traces, and to plan for a human mission. For NASA's live coverage, see below or go here or here. Infographic Source: NASA JPL. To see the full-sized image, go here.